Racing season is upon us at the Dacotah Speedway. 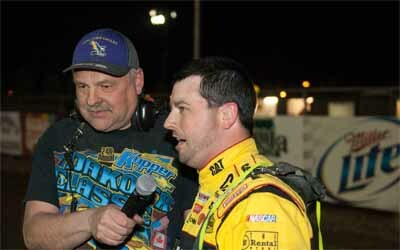 The green flag waved for the first time since last August and race fans were not disappointed as almost 120 drivers hit the high banks on Friday, May 1st. The track saw a record breaking opening night attendance and those fans were treated to some great battles for the lead as well as some amazing three and four wide racing. A 10 lap IMCA Sport Compact feature was the first feature of the new season. Jason Berg and his Days of Thunder tribute car started on pole however, Kody Stoxen slipped by on the start to take the lead. Berg and third place Josh Roehrich kept pace with Stoxen while Alex Thompson tried to hold off Chase Schlafmann for fourth. Schlafmann would overtake fourth place from Thompson but Thompson rallied back to challenge for position just before getting loose in turn four, which allowed Brandon Anderson to grab fifth place with five laps to go. When Roehrich got loose in turn two, Schlafmann blew by for third but Roehrich battled back. They raced side by side for several laps until Roehrich retook third place with one lap to go. Roehrich held off a last lap charge to finish third ahead of Schlafmann as Anderson finish in fifth. Kody Stoxen led all 10 laps over Jason Berg to win the first feature of the year. After a WISSOTA Street Stock concy and two IMCA Modified concies, a 15 lap hobby stock feature hit the track. Pole sitter Wyatt Rath-Wald of Napoleon led the race early. His cousin Jaren Wald, also from Napoleon, quickly challenged Rath-Wald for the lead. They raced side by side while Nathan Messer and Jeremy Engelhardt race door to door for third. Wald took the lead before a lap five caution re-set the field. On the restart, Engelhardt passed Rath-Wald for second and was all over Wald's bumper for the lead. With seven laps to go, Engelhardt slipped by Wald to take the lead, leaving Wald to contend with Rath-Wald for second. They raced side by side for several laps but with three laps to go, leader Engelhardt over drove turn one, dropping from first to seventh. Wald and Rath-Wald were now battling for the win and continued to race side by side until Rath-Wald powered into the lead with one to go. 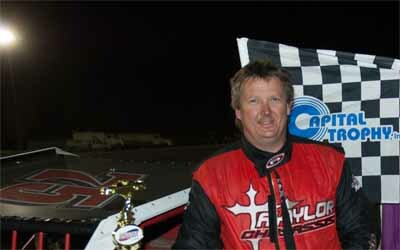 Rath-Wald held off his cousin for the feature win, his second career win at the Dacotah Speedway. 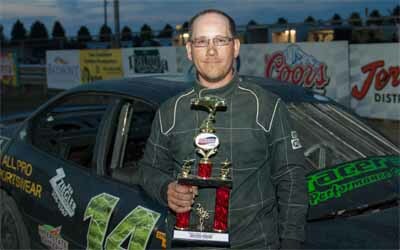 Last year's Hobby Stock track champion Brent Vetter finished third, ahead of Keith McCleary and Nathan Messer. Scott Gartner and Zach Frederick started on the front row of the WISSOTA Street Stock feature . Third place John Weber Jr. took it three wide for the lead but lost control of his car, spinning in turn four and bringing out the caution. Gartner and Frederick battled for the lead on the restart while Shawn Volk, Dustin Frank and Matt Brendel raced for third. Gartner held off Frederick for the lead and started to pull away from the field. Frederick fell into the clutches of Volk and Brendel and they raced hard for second. Brendel shuffled into second and pulled away while Frederick and Volk had their hands full with fifth place Dustin Frank hot on their heels. Using the high line around the track, Frank muscled by both Frederick and Volk. With eight laps to go, Frederick got loose allowing Eric Harpole to fly by for fourth. Harpole one of the quickest cars on track, quickly caught third place Frank and passed him with seven laps to go. Lapped traffic became a problem for leader Gartner which helped Brendel catch the leader in a hurry, however, Brendel ran out of time as Gartner led all 20 laps to win. Eric Harpole finished third as Dustin Frank and Zach Frederick rounded out the top five. 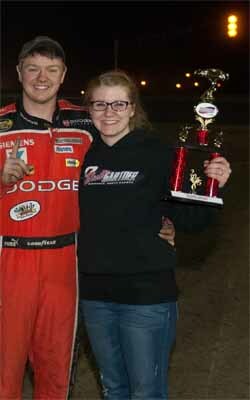 Last year's INEX Legends track champion Donavin Wiest picked up where he left off by pulling away in the INEX Legends feature. Young Troy Hoff passed pole sitter Drew Papke for second and quickly ran down leader Wiest. Hoff took the lead on lap three but Wiest regained the lead the following lap. Third place Tom Wagner had his hands full trying to hold off a fast Casey Martin. Martin would grab the position and catch second place Hoff. They briefly raced side by side before Hoff closed the door, hurting Martin's momentum and allowing Wagner to challenge for position. They raced hard for third, but contact with five laps to go gave Papke the opportunity to sneak by and take fourth from Martin. Wishek's Paul Morman challenged Martin for fifth and coming out of turn four, coming to the Open Road Honda finish line, Morman narrowly edged Martin by inches to take fifth place. Papke finished fourth behind Wagner as Donavin Wiest went on to win the feature by nearly a second over second place Troy Hoff. 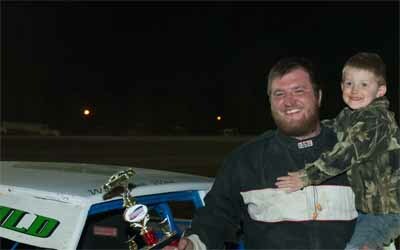 Spencer Wilson was in a class of his own in the IMCA Modified feature. Starting on the pole, Wilson distanced himself from the field and it was a race for second as Tyler Velo tried to hold off Jeremy Keller on the start. Keller would take second from Velo, bringing Marlyn Seidler with him. A lap 12 caution regrouped the field and on the restart Seidler slipped by Keller for second before another caution slowed the pace again. Brad Hanson grabbed third from Keller on the restart and challenged Seidler for second before yet another caution re-set the field. Cautions were the down fall for Keller as he lost a several positions to last year's track champion, Shawn Strand and Mark Dahl with seven laps to go. However, cautions didn't phase leader Wilson as he was able to pull away yet again on the final restart with six laps to go and win the feature in dominating fashion. The wily old veteran, Marlyn Seidler, finished second ahead of Mike Hanson while Shawn Strand held off Mark Dahl for fourth. Up next on the high banks of Dacotah Speedway is the Starion Financial, Hirsch Floral & Gifts Mother’s Day race. Front gates open at 6 and the green flag flies at 7pm.